This is my tried-and-true favorite! Fasting is not easy. You’re surrounded by food all the time and we have to do whatever we can to try and keep ourselves on track. I only wish I had found this stuff sooner! Whether you’re sweetening tea, coffee, or water; this is perfect for everyone. Because it has virtually no calories or carbohydrates, AND because it’s all natural, it’s the best thing you could use for any diet! There’s tons of varieties on Amazon, so go check out the massive selection. This is my particular favorite brand but please give some of the other ones a try as well. Trader Joe’s Powdered Stevia can also be used in baking! This is another favorite of mine. While I still prefer coffee and tea, sometimes it’s nice to have something cold and refreshing as an alternative to the hot drinks. I’ve been buying Zevia for years and I love it. Unlike the diet sodas, this stuff is all natural and much healthier for you. What’s not to like? My favorite flavors are the Grape and Cream Soda ones, followed closely by Ginger Ale. Buy a variety pack and find your favorites! Water is the most essential part of any good diet. It has been proven time and time again to be an excellent way to lose weight and keep your hunger levels down. However, most people just don’t like the taste of plain water. I’m lucky enough to love plain ice water, but if you don’t, it’s not a big deal. Plain water is great and all, but a little flavor is always a nice change. These are perfect for staying fasted but still getting some extra fun during the day. With only 5 ingredients and multiple flavors to choose from, you can’t go wrong with this! My favorite is the strawberry watermelon, followed closely by the orange mango! Coffee alternative: Crio Bru roasted cocoa beans. Not a fan of coffee? Missing sugary hot chocolate drinks? This is perfect for you! I love coffee but when I want something less harsh or more mellow, this is my drink of choice. Just brew it like coffee and sweeten with a little bit of stevia. It tastes just like hot coffee, but it’s actually good for you! Like coffee, there’s virtually no carbs or calories, so it’s perfect for fasting. It helps me stay fasted by providing some extra energy in the form of theobromine, which is a relative of caffeine. Unlike caffeine, you won’t get the jitters or nervousness, but you’ll still have plenty of energy! Theobromine is far more gentle and longer lasting than caffeine, plus it’s non-addictive. Plus, roasted cocoa beans are packed with an amazing nutrition profile, namely the ones your body needs to fight hunger! Read more here. After I brew up a cup or two of this, my hunger quickly dissipates and I can easily focus on my work. Give a try! Last updated by Yossif on December 29, 2016 . 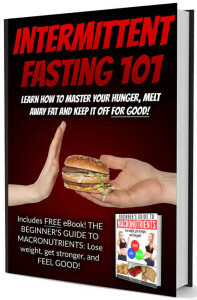 Intermittent fasting 101: Master your hunger!